The Axe Historique or Historical Axis is the line of monuments, buildings, and thoroughfares that run from the center of Paris – from the Louvre and along Champs-Élysées and Avenue de la Grand Armée all the way to the outskirts of the city at La Défense. This axial line has been carefully maintained to ensure that it is aligned or not noticeably skewed from its start point at the Louvre to its end point in La Défense. The Axe Historique began with the creation of the Champs-Élysées in the 1660s and has been extended over the years – in 1836 with the Arc de Triomphe, in 19th century with the extension of the Avenue de la Grand Armée, and in the 1950s with the ambitious projects around La Défense. Today, the Axe Historique begins at the Louvre and runs northwest, bringing to bear many attractions along the way. 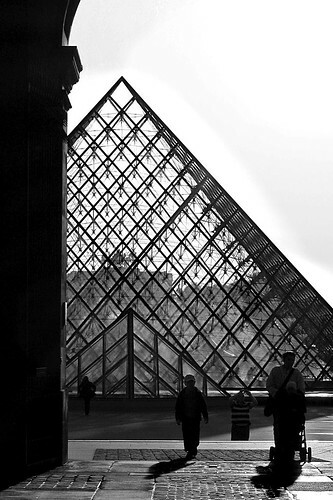 From the Louvre running northwest, you’ll first encounter the Carrousel du Louvre, which is a shopping complex that looks like an inverted glass pyramid. The complex contains various stores and a food court often patronized by crowds of Louvre museum visitors. Past the Carrousel du Louvre is the Jardin des Tuileries, the famous Tuileries Gardens where Louis XVI and his family were kept under house arrest during the French Revolution. Continuing northwest, you’ll run into the Place de la Concorde, where there are two museums there: the Musée de l’Orangerie and Musée du Jeu de Paume. It is at this point that the Champs-Élysées begins. This famous strip continues all the way until the Place Charles de Gaulle where you’ll find the Arc de Triomphe. Along Champs-Élysées, you’ll find shops, café, and restaurants as well as the Grand Palais and the Palais de l’Élysée, which is technically part of the Faubourg St Honoré quarters. After the Arc de Triomphe, the Avenue de la Grand Armée begins. Along this avenue, you’ll find the Palais de Congrès and the Bois de Boulogne park before arriving at La Défense, where the axis passes through the Center of New Industries and Technology (CNIT) and La Grande Arche de la Défense. The former is a convention center and one of the first buildings built in La Défense. The latter, La Grande Arche de la Défense, is an icon of the business district with its hollow cube form standing 360 feet high. The arch itself houses an exhibition gallery called the Musée de la Défense, which showcases the works of lesser known French artists.